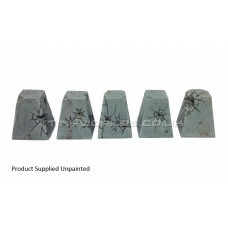 Set of five (5) damaged concrete dragons teeth tank traps without bases, ideal for many modern and sci-fi based tabletop wargames. Each trap is 30mm in hieght by 25mm in width and great for scatter material around the tabletop or as cover for your troops. For 28-32mm scale.